You know I love fennel. And I can hardly get enough of chickpeas. So why not combine these ingredients into one glorious, citrusy dish? Kalamata olives contribute a satisfying saltiness, and couscous makes it a meal. I’d had this recipe from The Kitchn bookmarked for a while and finally decided to give it a go on a cloudy Wednesday. Totally worth it. In fact, it was hard not to keep nibbling…I had to put the leftovers away quickly before they disappeared! This makes a wonderful, healthy lunch and is a full meal in itself. Caramelizing the fennel takes a bit of patience, but the rest is quick and the end result is worth the wait. Slice the fennel bulbs, then cook them in 2 tbsp of olive oil in a pan over medium heat, stirring occasionally. It will take 10-20 minutes for the fennel to soften and caramelize, so do all the other prep while it is cooking. Put the orange juice plus enough water to make 1.5 cups of liquid in a small pot. Add 1 tbsp olive oil, orange zest, and salt. Bring to a boil, then take it off the heat. Stir in the couscous, cover the pot, and let sit for 5 minutes. 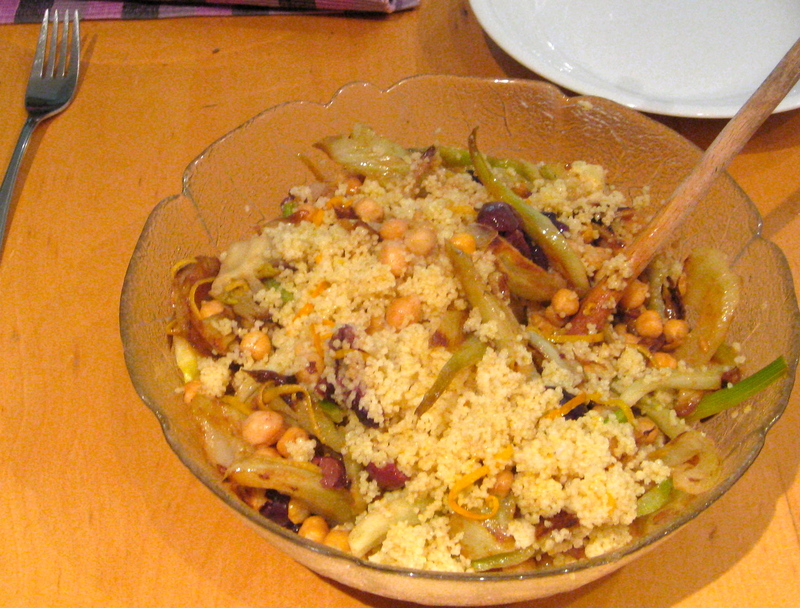 After 5 minutes, fluff the couscous with a fork and transfer to your serving bowl. In a small bowl, combine the coriander, chickpeas, olives, and lemon juice & zest. Stir to combine. When the fennel is caramelized to your liking, pour the chickpea mixture into the pan and cook for another 5-10 minutes, stirring occasionally, until the chickpeas are warm. Stir the chickpea-fennel mixture into the couscous and eat plain, sprinkled with some nuts, or with a dollop of Greek yogurt. This entry was posted in food, full meals, health, pictures, recipes on 08.05.2013 by taplatt.